TONS OF SUMMER FUN FOUND HERE!! 8 bedrooms, 4 full baths, fully furnished!! Accommodates 20 comfortably! Life IS at its best at our rustic , HUGE 8 bedroom, 4 bath home nestled on 500 private acres in the majestic Green Mountains of Vermont. Justin Lake Lodge offers breathtaking views, not to mention the wonderland of nature that awaits you here. How about an entire 22 acre freshwater spring fed lake ALL TO YOURSELVES? Yes, this lake is Exclusively YOURS, no one else but your party will be allowed on or near it while you're there. There's a huge fire-pit lakeside, ( we supply all of your firewood, no extra charge) a large deck built over the lake that has tables, chairs and umbrellas. The lake features fantastic swimming, canoeing and fishing experiences. Have little people? There is a swimming area marked off for them and a sandbox to keep them busy. We have 2 canoes and an assortment of life jackets in the boathouse for your use. As for the house, we offer 8 large bedrooms & 4 full bathrooms with plenty of open living spaces. 3 large adult bedrooms are downstairs with 2 baths. ( One being handicap friendly) 3 adult bedrooms and 3 children's bedrooms are upstairs with another 2 full baths. Upstairs, you will also find a huge play/game room which is also a huge hit with all ages. One side is for the kids 10 and under. That side offers their own TV, sofa, dining table for games, crafts and puzzles.Also, a toy box stuffed with toys for all ages, and a large bookshelf with reading books, coloring books, color crayons, paints, magic markers, and many games, etc. Many parents have remarked how nice it is to have a place that the children love and can keep busy so they can be downstairs ( within earshot) visiting with each other. The other side of the game/play room features a full size pool table and a ping pong table. This huge room as with all rooms, features many big windows which brings the outside in! Back to the first floor, The kitchen features a Vulcan restaurant cooking stove with 6 gas burners, double ovens and a big griddle top! This is a favorite of all adults and makes it fun and easy to cook for a crowd. If you don't feel like cooking inside, we offer a large gas grill on the deck. The deck spans about 40 feet of outdoor living and has picnic tables and lots of chairs to be able to sit and visit and relax, night or day. The house has 2 large Vermont field stone fireplaces. Although not used so much in the summer, they are available with plenty of wood, should you want to use them. The dining area is huge and seats 25 comfortably if you prefer to dine inside. If not the deck has 3 large picnic tables and lots of seating with a view. Manchester, VT is a big hit with everyone, its a 15 - 20 minute drive. Great restaurants, outlet shopping, parks and more can be found there. If you don't mind a 1 hr. drive, I suggest you go to an outdoor movie theater, the old time real drive-ins!! There are always movies for all ages playing on the weekends. ( Hathaway's Drive In , Hoosick NY ). There are not many authentic drive-ins left in the US, we happen to have 1 of them. On our 500 acres is a real Indian Burial Ground. Our Caretaker will take you on a tour if you wish to visit. You can hike on our 500 acres or do a bit of hiking the Long Trail, located just a few minutes from the house. Another favorite is a visit to the Vermont Country Store, a fun family outing! I can go on and on about things to do, but the fact is there are so many things to do for entertainment in this area they all can't possibly be listed here! During your stay, we can arrange for anything you want. Imagine, having help with pre-arrival groceries, maid service, and reservations for everything from ski-lift tickets, to fine dining. Want the perfect Vermont wedding? We will help with providing the official, catering and planning. We can offer local secrets on what to do, where to go, or even help you to hire a local chef to create a tailored feast for your family and friends. This is the PERFECT vacation home for large groups. No need to worry about the neighbors because there are none. Plenty of parking for several vehicles. Children welcomed!! Please note: The 8 weeks of summer and all ski season holidays and weekends often book out months in advance. Reserve your dates today to avoid disappointment! Please note ~ Christmas, Pres. week & all of July and August is rented by the week only. *Upon reservation through site, a LEASE will be sent directly outlining all remaining deposits and tax information due. Once signed and received with all additional payments received, reservation will be confirmed. A~ Z Awesome, Bright, Clean. room to Dance, efficient Layout, FUN, Glorious sunrise and sunsets, Happy place, Interesting history, Bungee jumping, Kite flying, Large bedrooms, laughter , Mountains, Nothing like it anywhere, hear the Owls, Ping pong tournaments,Quintessential, Roaring fires,Spacious, flat screen TV, Made in USA, Vibrant, Wifi, Yoga, get your Zest back!! Can anyone help with the X??? EVERYTHING but your personal effects and groceries are already there for you, even the firewood is included for you! Lots of (free) parking. WIFI. 22 acre freshwater lake that is 100% just for you and your guests to enjoy ( no one else is allowed on it while you're there). 500 Acres of beautiful untouched forest to explore. One of the largest homes in the area, at 20 people occupancy you will NOT feel crowded. Fantastic views from throughout the house, several golf courses and ski areas just a short drive away. Lots of attractions and shopping close by. All sorts of outdoor activities available on site such as horseshoes, badminton swimming, hiking, snowmobiling, snowshoeing,etc. You will feel far away from civilization on this mountain setting, yet the grocery store, restaurants, farmers market, gas stations, pharmacy, hardware store, liquor store, organic meat store, awesome bakery and more are just 3 miles away! Gorgeous mountain views all around you ! You have the side of a mountain all to yourself !! Between 10-25 minutes of 5 ski resorts. Stratton Mt., Bromley Mt., Magic Mt., Mt. Snow and Okemo Mt. 2 large fireplaces, both made from Vermont field stone.Gorgeous! All the firewood you need is provided, free of charge. 1 refrigerator in kitchen, 1 in basement to save on trips to the grocery store. Vulcan restaurant stove with 6 burners, 2 ovens , broiler and a large griddle top. Vulcan restaurant stove with 6 burners, a large griddle top & double oven. We strive to have all the utensils you could need.We also have a great assortment of cook and bakeware, We have a lobster pot, mixer,toaster oven microwave,mixing bowls,serving platters, and more. We have both a regular coffee maker and an x- large coffee maker. A 4 slice and 2 slice toaster and toaster oven. We offer a well stocked array of dinner dishes, cereal bowls, sandwich plates, drinking & juice glasses, coffee cups,wine glasses,etc. 2 wooden dining table sets and if you need extra several fold up tables and chairs are available. Lots of books for the children, magazines for adults. The children have 1 side of the game room,their own TV, sofa, dining table for games, etc, a full toy box, many games, books and puzzles.The other side offers a fireplace & ping pong and pool tables. Lots of games and puzzles for the children, card games for the adults. A huge toy box of Toys! A selection is provided for both children and adults. Enough lawn to hold a 100 guest wedding, anniversary or reunion party with a great place for live band! 2 canoes provided. Kayaks , paddle boats, boards , etc.can be rented. They will deliver them onsite and pick up when you leave. Bicycles not provided, but a wonderful, quiet and safe place to ride if you want to bring your own! Large gas/infrared grill on deck . Use-able year round! We supply all the gas you need. A huge deck attached to the house and a second 'floating' deck on the lake. 4 major ski areas within a short distance from the house. 1 tennis court in the area. Wheelchair ramp for access, 1st floor bedrooms. PRIVATE 22 ACRE LAKE, just for you!! House is fully furnished including bed and bath linens, you need bring nothing but your luggage and groceries! We booked Justin Lake for a 30th birthday celebration/ski weekend. The property feels secluded and private, but it's a very quick and easy drive to Londonderry, Manchester and Stratton Mountain. The house itself is huge and can easily accommodate a big group, but the living spaces feel quaint and cozy. We enjoyed playing games by the fireplace, cooking together on the industrial grade range in the kitchen and sledding on the hill in the front yard. Kathy was a wonderful host! She was responsive, accommodating and helpful with recommendations. All-in-all, it was perfect. We hope to be back very soon! Everybody fit... superb private lake! More than enough room, and privacy, for our 12 adults and nine grandchildren. Good bedroom arrangement on two floors. Game room with pool and ping-pong and more space for reading and games.Hiking, biking. Lower basement space for bikes and gear. Bear encounter one morning. A private lake - canoes and fishing gear and floats in the shed by the dock/deck. Huge house deck with picnic tables, umbrellas, two BBQ's and plenty of deck chairs. Easy ride to food and spirit stores. Visit the working farm and stop at the local bakery. We did all meals at the house using the super-stove. If Nana or Pap-pap have knee problems, best to have a four wheel drive vehicle to get down to the lake - not a long walk, but Google Map doesn't show the elevation. Worth it when you get to the lake. Family vacations are voted on - but almost all agreed Justin Lake could merit a return visit. Thanks Kathy and Bruno! Ed and Helen and family. Our family stayed for a week in this beautiful vacation home. We had no idea what to expect, but our adventurous spirit was ready for it all. The house was charming, well decorated, cozy and quite spacious. The surrounding land was (at the time) buried deep in fresh snow to our delight! It hampered our ability to explore too much of the land, but a walk down to the lake was well worth the brief hike - it was picture perfect and simply breathtaking. I could easily imagine every season spent there. As it was frozen solid that day, we spent a brief time tossing pebbles and sticks onto it and enjoying the solid "thwack" of them hitting the ice. The surrounding small town is just lovely. Cafes and small shops, a local farm (Taylors Farm) where you can buy farm fresh artisan cheeses - we went on a sleigh ride there that was heavenly! The local foods were excellent and the people were charming enough to have us wishing we were ready to move for good. The house had enough offerings that on the coldest days we were content to stay inside, play pool, ping-pong, read by the fire and enjoy the beauty of our surroundings. A well-appointed kitchen covered all of our needs for a few meals at the house. When a heavy snow fell, we awoke to the driveway freshly plowed and salted for us by the caretaker. Our only drawback was a rare mishap...we landed there during a week of brutal winter storms, one particular night went to 20 below zero. On our last night, the furnace had enough and quit on us at close to midnight, leaving us shivering through the night and sounding off low temperature alarms. Given the late hour and the severity of the winter storm, which was on the heels of one right before it - we had trouble raising the alarm for help so late, and there honestly wasn't much anyone could do. The roads weren't safe and in a small, quaint, charming town - there's not going to be a middle of the night handyman to come to the rescue. For a group of Floridians, this was a pretty memorable experience! I wouldn't (and didn't) count this against the property - things like this happen and we just got "lucky". We hated it in the moment, spent the night shivering close to the fireplace in the living room and hit the road a bit earlier than planned in search of heat the next morning through yet another snowstorm - but it added to the adventure and our winter getaway story. This house is perfect for a large group of friends! I have stayed there with 15+ people 5 years in a row for 2 nights in the winter to ski Stratton. 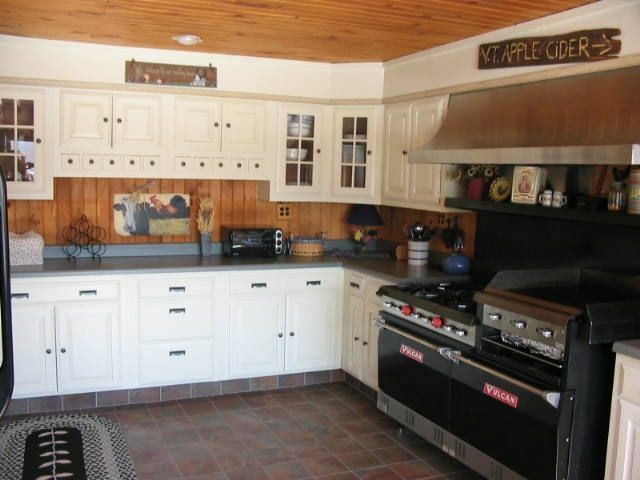 It has ample room for all the ski stuff, an AWESOME kitchen which is key when cooking for 15, flat top grill to accommodate dozens of eggs and pounds of bacon for ski fuel. And a fireplace to warm up at after spending all day outside, freezing. Not to mention, the setting is amazing, beautiful, and quiet, and there's plenty to explore just outside the door if you're not planning to go to Stratton. Great home, spacious, and a massive livingroom. Good for a weekend or a week wether you are planning to ski or stay in the livingroom by the fire. How about a fun-filled day swimming, canoeing or fishing on your very own lake, hiking & biking in complete privacy right from your front door or a day of downhill skiing or snowboarding at one of our many local ski areas followed by a nice relaxing glass of wine by one of our two stone hearth fireplaces? The possibilities of things to do are endless. Antiquing, golfing, swimming and fishing our 100 acre private lake,enjoying our phenomenal game/play room in our spacious and fully furnished 8 bedroom home, a day of shopping in Manchester, Vermont's famous outlet stores, horseback riding, sleigh rides, hiking the Long Trail and of course Vermont's brilliant fall foliage!! Our property is the perfect get-a-way for any season. You and your family will never be bored - unless you want to be!